You know it's bad when the guy at the quick lube place gives you a discount on labor. This week has had it's fair share of ups and downs. Let's start with some ups, shall we? 1. 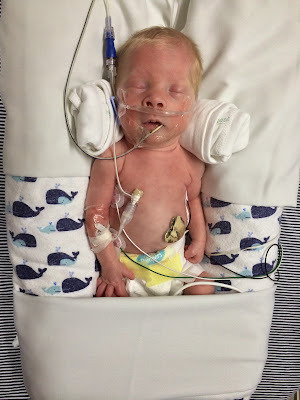 Saturday night is bath night in the NICU and Isaac did so well breathing on his own for the 30 minute duration that the nurse obtained orders to discontinue CPAP and switch to a nasal cannula. 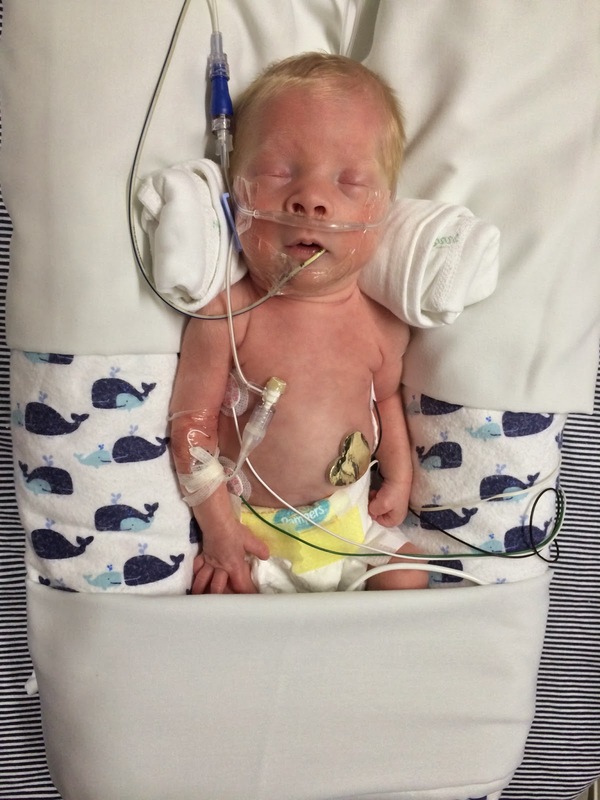 One step closer to breathing on his own, and so much more comfortable. This looks so much more comfortable, doesn't it? 3. Monday, he was having a little bit more of a hard time breathing, but an extra dose of caffeine (all NICU babies are given caffeine, so just go ahead and have some if you're worried while gestating) and he was back to his usual self. 4. Wednesday was Isaac's 1 month birthday. When I held him that night, they swaddled him for the first time. Skin to skin has more benefits, but it was nice to be able to see his face, especially since he is awake more often now, as opposed to practically never just a few weeks ago. Low lighting in hopes he'd open his eyes. He didn't take the bait. 5. And then yesterday, not so much. After multiple apneas and bradycardias, or A's and B's if you're down with the lingo (which he has had before) the doctor made the call to put him back on CPAP and ordered a full blood work up. You know how veteran moms can pretty much make the call that their child has an ear infection or strep throat? Well, I'm that way about anemia. As soon as I learned about the changes in his condition, I just knew Isaac was anemic. It's happened before and that's what the blood work showed. Of course, he could still have an infection, and there really isn't time to wait the 48 to see what the blood culture says on that one, so his feeds were discontinued (again) and he was started on antibiotics (also again) and given a blood transfusion for the anemia (I'm gonna let you say it this time). 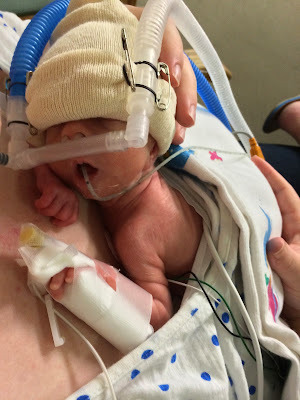 Is any of this atypical of a preemie? Nope not really. Especially since he's a white boy. Seriously, the nurses call it "wimpy white boy syndrome". We can't be too hard on him though, after all, it's hard to have good blood oxygen saturation when you don't have enough red blood cells to oxygenate. After two rounds of blood, he's feeling much better. 6. On top of that, I spent 3+ hours getting the car's oil changed and tires rotated. Easy enough right? But they couldn't get the tires off because among things stolen in our two-for-one car/apartment break-in back in February was the wheel lock key. I got a discount on labor just for telling them about the theft. Who knows how much money I could have saved if had whipped out a picture of Isaac. $170 later, that's all sorted. 7. And the icing on the cake is that Mark's been out of town since Wednesday, coming back tonight. The cat threw up. And I'm having my gall bladder removed on December 4th. 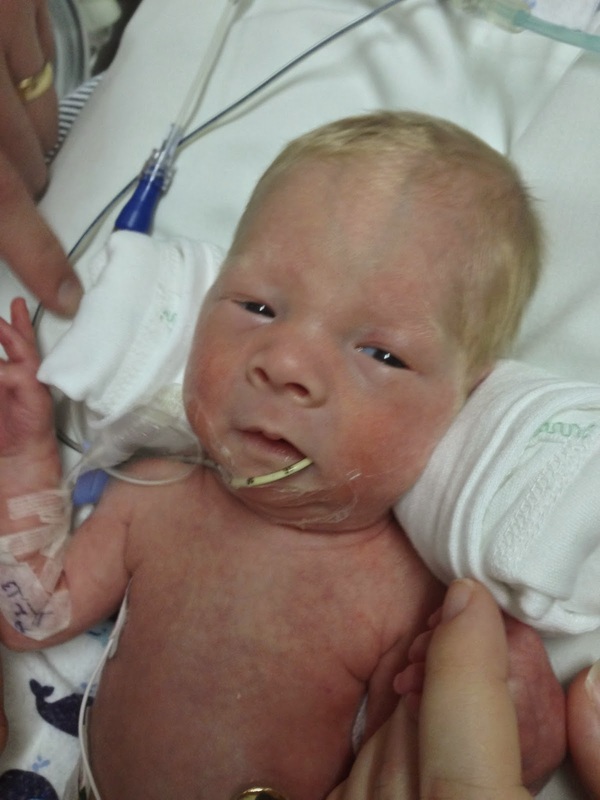 Even if he did have to go back onto CPAP, he's getting chubbier before our very eyes. Look at that double chin! How many will he have when he's more that 5 pounds? Currently hovering around 3 lbs. 10 oz. P.S. If you're worried about me after reading this, know that I'm actually ok. Bluebell Ice Cream and a nap tend to have that effect on me. I'm going to go eat some sympathy ice cream now. Oh hugs hugs hugs and prayers! That back and forth and back again in the NICU can be rough. He's beautiful! I hope this week gives you a bit of a break! Anne, power to the NICU mommas. We spent 44 days there (and countless more days/weeks/months) for follow-up surgeries. I have your back. I know how hard it is. And I had my gall bladder out, too! Hang in there momma. If you need some support, pop in over at http://preemiebabies101.com - it is a wealth of knowledge and support. Only mommas who have been in the trenches know. 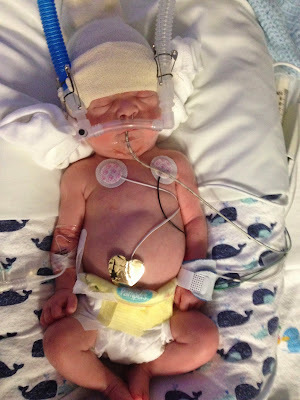 Off the CPAP is huge! You guys are in my prayers. For all the things, the sucky ones and the happy ones. Issac's hair! Absolutely yellow! He's so, so sweet. he is so adorable, and I'm with Cari, I love his sweet little blonde head! I can't say anything you don't already know, and then some! I'm praying. I can tell that Isaac already knows how much he is loved. Just found you through Conversion Diary. Will say prayers for you sista! And your wee boy! I meant that to say "Big Hug"
Another visitor via conversion diary & will say prayers for your family! What a cutie your son is!! Oh, Anne! I hate that you three have had such a rocky week. I'm praying for you as always! I can't tell you how excited I was to meet Isaac. He's just mesmerizing. Loving the double chin, hope he hits the infection to the curb soon. Your 'wimpy white boy' looks like a real fighter to me. 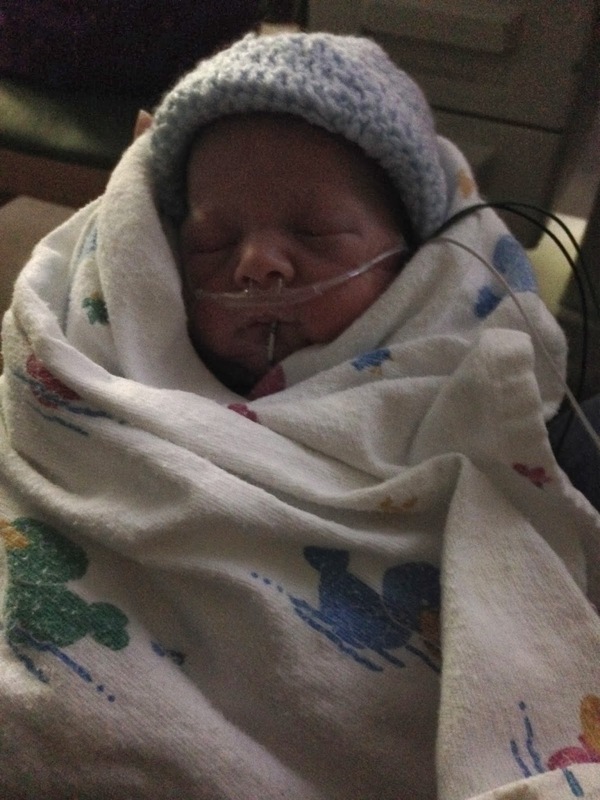 Hang in there little man! Prayers continuing for you all. Oh such a sweet sweet baby! I love seeing your photos! So much blond hair! I love it! Hang in there lady, more prayers are coming! I was absolutely going to comment that he has already gotten chubbier in less than a week! He is absolutely beautiful. What Kelly said! Just clicked over from Conversion Diary, and sounds like the lot of you are fighters! I had my gallbladder out when my 2nd son was a year old. Quick recovery if they are doing it laparoscopically. And you will feel SO much better. I didn't even realize how horrible I had been feeling until after it was out. And he's just precious - so much blondy-blonde hair!! He's SO cute Anne! And so blond! ;) I'll keep you in my prayers. Love! Love the golden hair! Just like yours!